Today we offer some some tips for attending conferences from guest blogger and relatively new conference-goer Jane Makuch. Jane will be attending the SCBWI Annual Winter Conference and the pre-conference Writers Intensive. (If you're attending, be sure to say hello to her when you see her in New York.) She's currently revising a YA manuscript. Develop a 30-second pitch. Not just for agents and editors, but also the dozens of times other attendees ask, "What's your book about?" Develop a 2-minute pitch for one-on-ones. So many new conference goers seem to think they need to spend the 10 or 15 precious minutes talking instead of interacting, answering questions and listening. This might be elementary, but be presentable. Fit the part--show up showered and well dressed. I've been rather surprised by the lack of hygiene, sweatpants, and dirty toenails sticking out of the end of sandals...eewww! Clean and pressed doesn't have to mean expensive, but it does show professionalism. No talking to neighbors during a sessions because you're bored or scared or overwhelmed. They paid to be there also. Have calling/business cards. Vistaprints.com has very inexpensive cards with quick delivery. Put blog and twitter addresses on them and use a nice size, readable font. Research the speakers ahead of time. Do you know of an agent who would be great to meet? If you have a polished manuscript, be ready to ask if you could query them. Then mention in your query that you met them at the conference. Don't be bossy or rude. Never ambush an agent or editor. No knocking on bathroom stalls or hotel rooms! You can't go wrong with a more formal etiquette. Kindness and respect will most likely get you noticed when presenting yourself with confidence and professionalism. What's your best advice for getting the most out of a conference? Leave a comment! And you can still register for the SCBWI Annual Winter Conference. 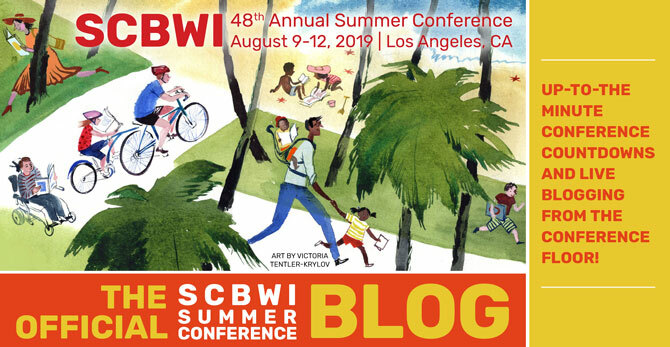 Click here for the SCBWI registration page. aaaaaaaand bookmarked! thanks for this :-) I'm unable to go to the Winter Conference this year, but I've got the Summer Conference marked on my planner! Thanks for the great tips Jane! Every little bit helps us newbies get ready for all of the excitement. Can't wait! I'm a newbie to this conference, but not to professional conferences in general, and I agree with all this advice, especially the one about the cell phones. My mantra: Be Here Now. I'll turn off all distractions (cell, iPod, thoughts of the next meal) and LISTEN. And thanks for the tip about pitching--I hadn't thought of that at all! Here's a simple tip (from years of trade shows) to keep you from re-handing out somebody else's card, or having to rummage through the stick (assuming you've got pockets): your business cards go in one pocket, e.g., left-hand side. Business cards you're given go in another pocket, e.g. right hand side. My YA novel, Letters to Leonardo was published as a direct result of attending a SCBWI conference in Sydney so I'd say, take advantage of opportunities to pitch your ms or have it professionally assessed at a conference...but make sure it is 'ready'...don't send in something that you haven't run past crit buddies first and left for a while then re-read and revised before you sent it. My other tip is to read works by the presenters and research them in advance...that way your questions can be informed and relevant.